Looks like I’m on a finishing roll, already second finished project for this month, and we are still in the first week (ok, I admit, a pair of socks and a pair of mittens, and both knitted mostly last month, but still). 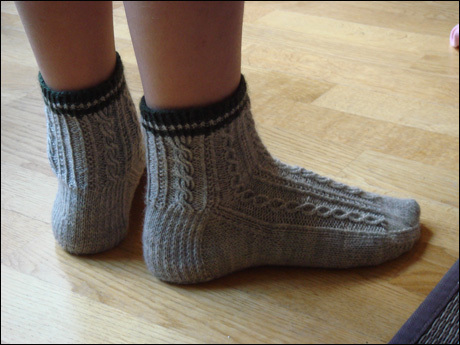 Hanna’s German socks got actually finished a couple of days ago, but I didn’t get modelled pictures until today. She is very pleased with them, and I think they fit her long and narrow feet very well. Project details: Pattern: cables patterns from the book Stricken Tracht und Landhausstil by Lena Fuchs, basic sock set up my own. Yarn: Fortissima socka in grey and forest green. Needles: 2mm dpns. 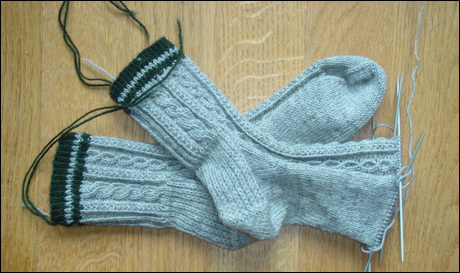 I have started to knit up a pair of Rosebud mittens. The pattern is written, but I'm knitting a pair in order to check in on the details, and to provide an other colour combination than the one I used for the first pair. Report will follow. I have also started a Print O'The Wave stole with some Wetterhoff yarn I have. I'm not really sure about that one, perhaps the yarn is too thin, but report on that project will also follow, as soon as I've got a little more knitted. 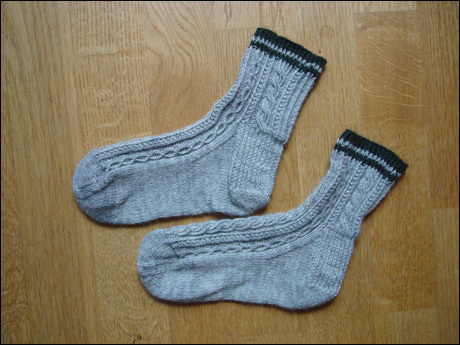 There is not much left on the German socks, only the toe of the second sock. I had lost some of my sock inspiration when I saw a pair of seriously cool socks, and decided to finish my socks before I started a new pair. 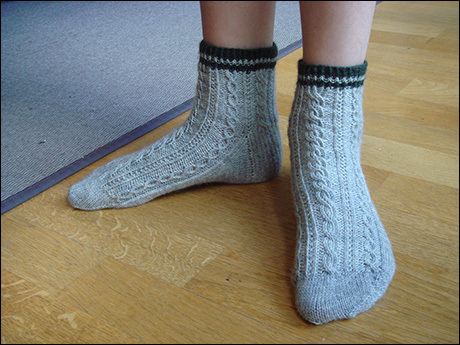 Go over to Mel’s blog and take a peak on her Chuck’s cabled socks. What an inspiration, and just what the knitting doctor would have ordered to get my socks finished! Sorry for being away for so long. It has been a busy, and partly difficult, time. The schools have started, and it is always the usual mess of new timetables, books and such. And then I went and make some unsuitable movements with my left leg, getting a terrible muscle pain that sent me for over a week on pretty heavy and energy draining pain meds. Not funny at all, and sad to say, the muscle is not at it should be, but I manage without the strong meds. Then there have been various family ceremonies, taking the rest of my time. With other words, not much knitting, and even less blogging. 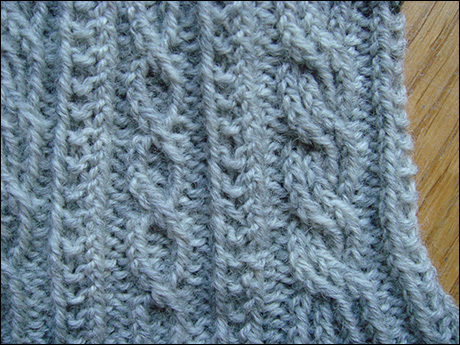 Blustery has got new buttons, a blocking session, and should be ready to be modeled. But the weather has not been on my side. Every day, when I has been at home, it has rained, making it impossible to get anything even close to a modeled picture. And when I’m away, yea, you guessed right, the sun is shining to no end. 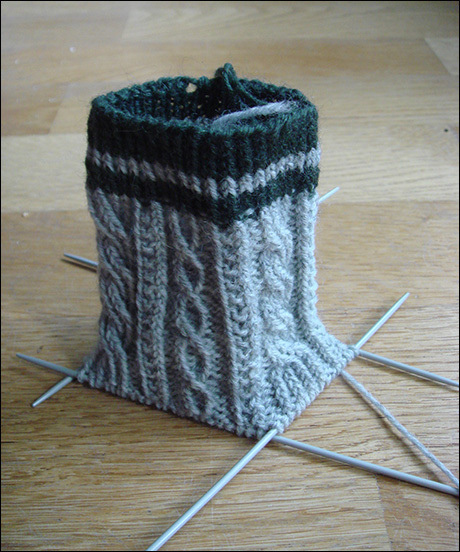 I have started a new sock. The pattern is one I copied from a book while in Munich. I can’t find the reference right now, but I know I have it somewhere, and I will post it. It was a book with German folk patterns, and there were a couple of lovely socks. The yarn is Schoeller&Stahl’s Fortissima socka and I’m using 2 mm dpns. 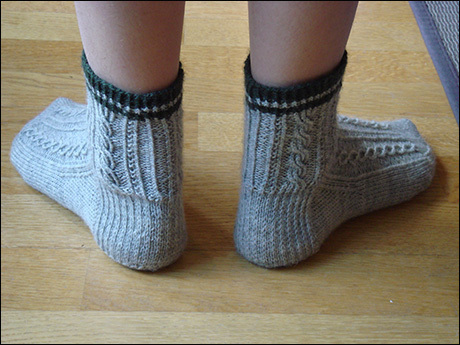 The socks will most likely be for my daughter, I suspect I don’t have yarn enough to make them bigger.